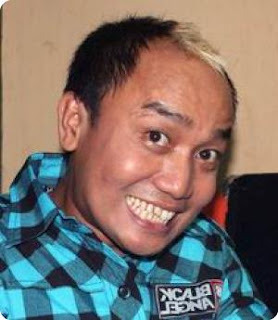 Muhammad Aziz was born in Jakarta, December 22, 1961, widely known as Stuttering OVJ Azis, Azis The career is also fairly not easy because in the early career, Aziz had paid droll Rp. 25 thousand only. Get paid were deemed insufficient life, Azis also tried a career by working in a building contractor. First time in the world plunge comedian, Aziz feeling the pinch because Azis can not funny. Aziz began his career with the stage comedy lenong from one village to another village. Subsequently, in 1999 he began working with Bagito in "pavilion" on TVRI. Azis along with droll Bagito acquainted with Patrio. And Aziz claimed funny learn from their peers, despite getting paid Rp. 25 thousand only, Aziz remains grateful to meet his wife and three children. Azis also tried another way to get more fortune to support his family by working in a building contractor. However, because he felt his life was in the comedian has finally Azis left the building contractor and returned to comedians. And it turns out the way to greater fortune is not always closed to Azis and his family's. Azis get input from a writer to portray a comedian who stutter. Since 2008, Aziz's career began to rise with the buffoon in Opera Van Java with Parto, Sule, Andre Taulany, and Nunung. Azis also plans to explore the world of singing by releasing the album. Besides being an actor and comedian in the world of entertainment, Aziz Stuttering is also a generous person and very sensitive to social problems. such case is evidenced by the involvement and social activities by establishing a boarding school called "Padepokan Aziziyah" in Bogor. a place of learning that cater for children who are economically disadvantaged. in the hermitage which is currently being built and siswinya students freed from cost.